Valentine’s Day is almost here and love is in the air. In addition to hearts, flowers and of course, chocolate. The three things necessary to proclaim your undying love and affection. If you aren’t walking hand in hand down the beach with your soul mate, and guys, if you didn’t “go to Jared,” I am sorry to inform you, you’re a failure in love. Or so retailers would have you believe. This is not love. Love can look like that and some days it does. Some days however, love is messier, it hurts, a lot. The people who love us will fail us. But there is another source of love, one that will never run dry, never change its mind. A love that is unconditional and undeserved. A love that stands by our side through thick and thin, always and forever, into eternity. Every one of us wants to be loved that way. Today if you have blacklisted Valentine’s Day, if your heart is breaking, if you feel like you don’t deserve love, you can’t find it, or you’re tired of searching for it only to have it let you down, there is hope. If your fairytale has turned into a nightmare, let me encourage you that all is not lost, and you are not alone. We have sung the song since we were little kids: “Jesus loves me this I know, for the Bible tells me so.” The Bible is full of verses about God’s love for us. Perhaps the most often-quoted verse of the Bible is this one: “For God loved the world so much that He gave His one and only Son, so that everyone who believes in Him will not perish but have eternal life” (John 3:16 NLT). Watch any major sporting event on TV and someone will be holding up a poster with John 3:16 on it; players wear it on their eye blacks. But because it’s everywhere and we memorize it as small children, I think it sometimes loses its effect on us. It becomes just a few words strung together without meaning. Before we can go any further, we have to fully understand the most basic principle that all of the others will be built off of. Love. Not love as you and I know it, but God’s love. This love is unfathomable; it extends beyond the bounds of our finite comprehension. My prayer is the same for you as Paul’s, written to the church at Ephesus. That you become empowered with inner strength, that your roots will grow down into God’s love and that you will understand how wide, long, high, and deep God’s love is for you. If we are unable to understand this, if we are unable to accept this, then we can go no further in our journey toward glory because everything else that I will share with you is based off this one truth. This is the firm foundation that everything else is built upon. There is nothing you can do to make God love you more. And there is nothing you can do to make God love you less. Love is not something God does. It is who He is. Since my diagnosis, I have felt God’s love overwhelmingly. Does that mean that it wasn’t there before? No. God had been waiting to shower me with love, but I was too busy to take the time to accept it. Crazy, but oh so true. Life has a tendency to get in the way, but God has the capability to slam on the brakes and make you take a pit stop and take notice of Him. God’s love came into focus very clearly for me on Easter Sunday three months after having been diagnosed with Takayasu’s arteritis, as we stood in church singing “I Stand Amazed.” Written in 1905 by Charles Gabriel, it is a timeless hymn, as true today as the day it was written. As we got to the second verse, the tears started rolling down my cheeks uncontrollably and continue to do so to this day every time I hear this song. Why? Because I finally had an idea of how much God loved me. I finally got it, in the true sense of God’s love. On the cross Jesus took not only our sins but our sorrows and our hurts and made them His own! Why? Because He is a masochist? No! Because He loved us, even before we ever were and before we ever loved Him. Even before our hurts, suffering, and pain ever came to be. Knowing that we would turn away, knowing that we would hurt Him, knowing that some of us would never come to know Him at all. He still took all of them. And not only that, but He did it all alone! He was separated from God, abandoned by His friends. In order to offer us forgiveness and salvation, Jesus took our eternal punishment. The ultimate get-out-of-jail-free card. He took our heavy baggage onto Himself and suffered and died alone. It absolutely broke my heart. So how can we not sing, “Jesus loves me, this I know”? How marvelous, how wonderful! So be honest, do you believe that? Do you believe that God loves you? Acknowledge that you have ignored His love. Tell Him that you are trusting in what Christ did on your behalf. Won’t you accept His love and His forgiveness of your sins? Won’t you rely on Him instead of on yourself? I would encourage you to take a moment right now if you can’t bring yourself to accept this gift of love and read Ephesians 3:16–19. Then close your eyes and ask the Lord to speak His love into your heart. 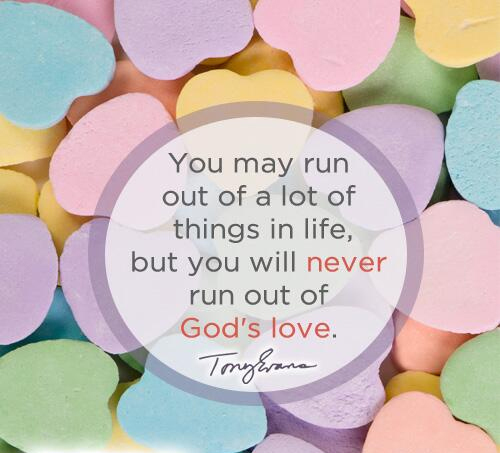 Today, no matter what day it is, celebrate Valentine’s Day, let God love you.